Elections across Europe show Europe’s political parties to be increasingly defined by how nationalistic they are. Confronting this and reinstating progressive politics is essential, and can best be done by giving more power to Europe’s regions, urges Giles Merritt. Giles Merritt is Founder and Chairman of Friends of Europe. This opinion piece was first published on the Friends of Europe website. He is also the author of a recent book ‘Slippery Slope; Brexit and Europe’s Troubled Future’ (Oxford University Press). Giving regional leaders sharper teeth in EU decision-making will take years, but ‘bringing citizens closer to Europe’ is the only way to diminish the appeal of populism. First, though, the eurozone’s weaknesses must be addressed. Until ten days ago, Europe had a heaven-sent opportunity to start fixing the eurozone’s problems, and so ensure that sixty years of hard-won economic and political integration would no longer be vulnerable to an eventual collapse of the single currency. That opportunity is evaporating. Hopes of a “Grand Bargain” for reforming the eurozone, and with that the EU’s ramshackle institutional framework, were largely based on a revival of the Franco-German ‘locomotive’, the partnership that for many years drove the EU forward. 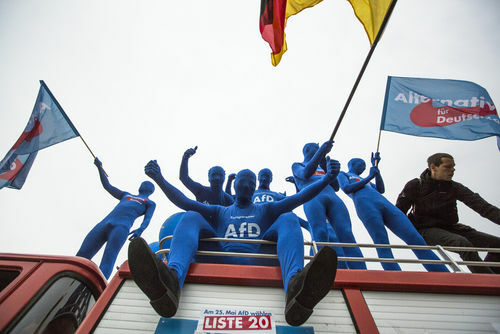 These hopes faded with the poor showing of Chancellor Angela Merkel’s CDU party when so many voters flocked to support the anti-EU, anti-immigrant Alternative for Germany (AfD) party. A eurozone deal may still be possible once Merkel has formed her new coalition government, even if the odds against achieving this have lengthened. Merkel and Macron see eye to eye on the need to make the euro a cohesive rather than divisive force, but know the devil is in the detail. Macron wants a eurozone ‘finance minister’ with control of a budget that would dwarf that of the EU. He believes this is needed to close the widening North-South gap between Europe’s rich and poor countries. Although German politicians generally dislike anything that looks like a mechanism for milking German taxpayers, until the elections there had seemed a growing consensus that the Federal Republic’s continued prosperity depends on maintaining Europe’s unity. Thanks to the election, however, the outlook for a eurozone deal is going to be unclear for months to come; it’s sure to be the primary focus of political attention in Europe, dwarfing even Brexit. Yet addressing the nationalism that has brought hitherto obscure populist parties to the fore will be far more important in the long-term. If EU integration is to be blocked by nationalist pressures, then Europeans must resign themselves to losing clout and competitiveness in the global economy. An awareness of this is producing fresh ideas for streamlining the EU’s structures and countering its unpopularity, notably from European Commission President Jean-Claude Juncker and Emmanuel Macron. So far, none of these ideas address the most obvious reason for people’s disaffection – their sense of being governed by distant powers. Regionalism, not to say separatism, has become a predominant force in Europe because voters perceive a centralisation of policymaking, by their own national governments and, above all, by the EU. The deepening Catalan crisis and the unresolved question of Scotland’s future status spearhead a wider discontent embracing northern Italy, Flanders, the Basque country and perhaps Northern Ireland. The answer is to create a muscular new regional body within the Union’s institutional framework. The toothless and much-ignored Committee of the Regions should be scrapped in favour of a mechanism that brings regional leaders and representatives to Brussels, and arms them with the sort of powers most central governments will want to resist. Some German politicians’ recognise that the eurozone must be safeguarded at all costs, even if that’s unpalatable. By the same token, EU member governments must see that empowering their regions is crucial to reining back the appeal of populist parties, and thus vanquishing Europe’s new nationalism. Tedious – & the usual stuff. Giving more power to regions (based on current democratic structures), just moves power from one bunch of politicos with noses in vaious troughs to another bunch of no less corrupt politicos – & for the sake of clarity – the curret crew in Catalunya causing trouble are no more or less corrupt than Ratjoy & his mates sitting in Madrid (or indeed the Tory dolts in London). There is a solution – contained in the book “Against Elections” – sadly its suggestions will never be implemented by the current crop of politicos – mainly because like turkeys they are unlikely to vote for christmas. Those that can be bothered to read ths comment – I suggest you read the book – it is revolutionary. The hidden opression and indoctrination of catalan nationalism into school was hiddenly out of control being automious . And the PP or PSOE slept 2 Decades before realising what’s going really on . Mike , I was in Tarragona pitstopping on way to south and began to speak spanish with the receptionist of the Hotel which was by the way the proprietary, he insisted to speak to me either French or ingles thus 2 times . I said I prefer in castellanish . So he gave up and was unhappy when looking at his face but next to him a woman secretary gave a cheerfully grin . I knew immediately what’s going on and that is a shame not letting someone speak on native spanish language in Spain . Mike are you from Spain ? Nope – but currently on holiday in …. Catalunya. I have some sympathy for the Catalan people – but if they think having their own gov will give them democracy = country size of Belgium – well take a look at Belgium – in terms of “democracy”. Elections do not & never will lead to democracy – & they also infantalise citizens – who every x years have a choice between X, Y, Z (professional) politicos who have varying levels of corruption attached to them. The problem with democracy is elections. Read the book. Thanx Mike which you further nice holiday there as long it’s quiet there . Yeahh givem until anarchy and Regionsplitts beginns in all countries beginns by defeating the democracy . What can be more stupid not to learn from the Colonel Tejero in 1981 and on what’s going now being too autonomious . Seems the writer lacks in a little bit of self determinations and history .